But these settings don’t meet higher expectations of serious users. Yes… uTorrent is already optimized right of the box to speed up downloads, but not everybody has the same network scenario, the same ISP, same bandwidth or same computer. Configuring uTorrent to increase download speed is relative to your resources. You might be fortunate to have a 500Mbps or even 1 Gbps, but unlucky with slow uTorrent speeds. Or you might be lucky to download at high speeds with at an average 1Mbps bandwidth. There are many uTorrent hacks that let you take full advantage of your resources. Do you want to increase download speed, protect from hackers, avoid port blocking or just improve the experience? The following 14 tricks and tips can make your torrenting experience fast and truly amazing. Before configuring uTorrent it is important to know your real bandwidth. This will give you an idea on how to optimise your speed and performance. The most popular method is running a speed test at speedtest.net website. Another easy way is to learn about your contracted Internet speed or plan from your Internet Service Provider “ISP”. If you want to stick with uTorrent, you can check the current bandwidth and network settings on the platform itself. Once the test is finished, uTorrent will configure itself for best performance. Running a test for is easy, just go to Options > Setup Guide. Check the Bandwidth and Network boxes. Choose the closest server to where you are, so you can have a more accurate measurement. Leave the rest by default. Check the results of the bandwidth test. uTorrent just configured itself for best performance. If the speed test fails. A result of “Connection failed error: Timed out (10060)” and “Port is not open (you are still able to download)”. A router or firewall could be blocking certain ports. Or “Automatic Port Mapping” could be disabled on your router. If you prefer to manually configure your uTorrent bandwidth settings, press Ctrl+P or go to Options > Preferences > Bandwidth. Supposing you already know your speed (bandwidth), which should be in Mbps. Notice that uTorrent is asking for kB/s under “Maximum download rate” not Mbps. There are some bandwidth conversion tools online, like ToolStudio or GbMb, which can help you convert those values. Having an unlimited upload rate will not always affect downloading speeds. In fact, limiting your upload power too much can even affect your download speed. Think about symmetry. uTorrent employs a mutual fair sharing algorithm, that ensures fairness in a torrent swarm. Users that upload more are usually prioritised. And if you limit upload too much your download speed will be affected as well. Limiting uploads depends on your usage frequency and bandwidth plan. For example, if you have a fixed bandwidth (Cable, Fiber, ADSL, etc), leave defaults. But if you have a limited download speed (usually mobile data plans), then lowering upload speeds is a good idea. Reduce at least 25% of your upload. For example, if your upload speed is 1Mbps (from Speedtest.net) and if 1Mbps is the same as 125kB/s, then 0.75 Mbps is 94kB/s (from Toolstudio). If you reduce upload rate too much, the TCP acknowledgement packets will be delayed and get lost. This will bring congestion to your application (slow download rates). Don’t focus too much on reducing upload speeds, instead work on smaller queues. A large queue of uploads will definitely affect your download speed. There are no best queue settings in uTorrent, it all depends on your downloading needs. If you are eager to download 20 files at a time, you can configure the uTorrent application to do so. But remember, each file that you download at the same time will take a piece of your bandwidth. File consolidation and completion will take longer times. If you have all the time in the world, keep a long queue. But if it is download speed what you are looking to improve, a smaller queue will accomplish it. To adjust the queuing settings, go to Options > Preferences > Queuing. A low “Maximum number of active torrents” will ensure a steady download speed. To ensure at least two active downloads and one upload, go for a 2:1 download/upload ratio. But remember never to limit uploads too much. In the example picture, from three active “upload/downloads”, two of them will be a guaranteed download. But everything is in relation to your speed. With a 500Mbps you can use a 1:1 ratio and go for 20 active upload/downloads. 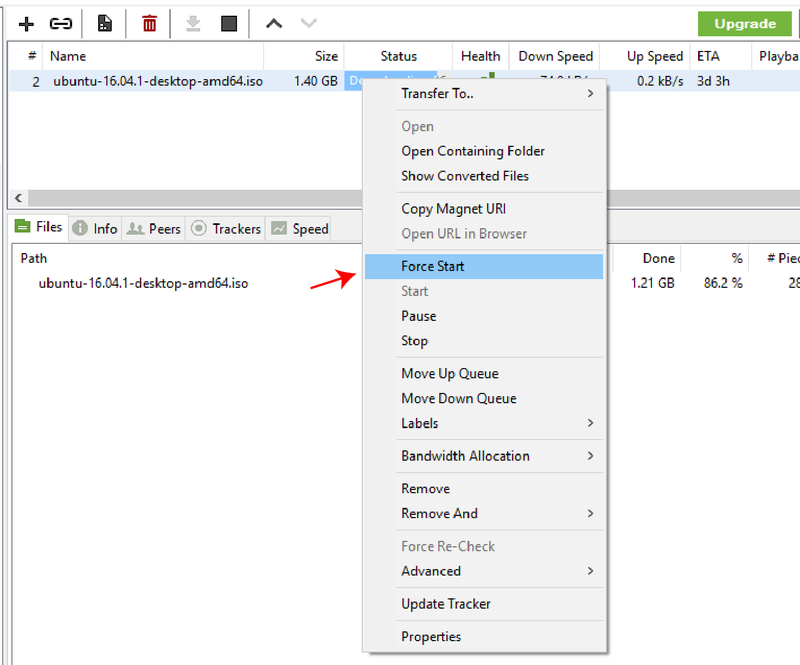 To override queue settings, “Force start” a torrent download. 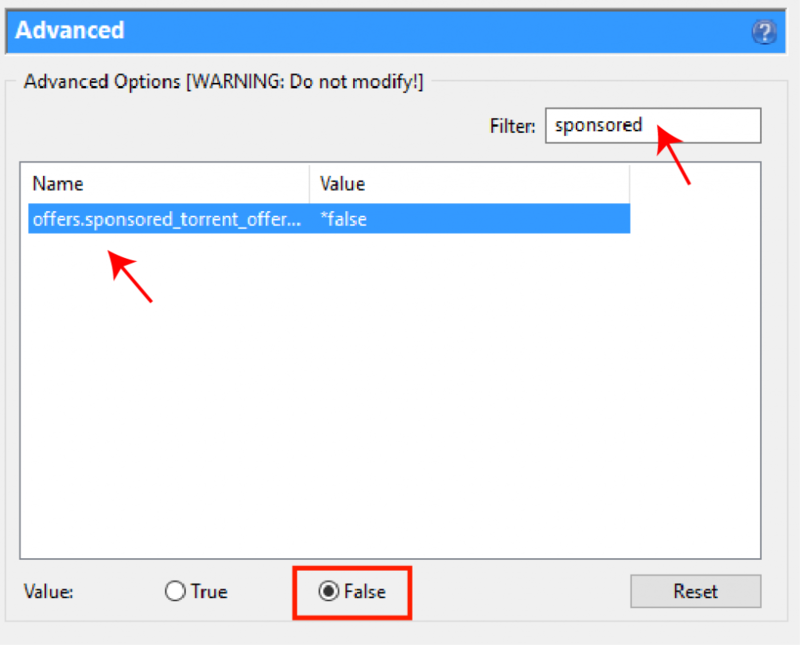 Force starting a torrent allows bypassing any rules already set in the uTorrent app. For example, if there is a queue limit to 3 downloads and you need to download the fourth torrent without changing configuration, then force starting is a way to bypass the rules. If you have more torrents downloading at the same time and you want a specific torrent to be prioritised. You can right click the downloading torrent, go to Bandwidth Allocation and choose your specific priority. But having 20 torrents queued with a high-speed bandwidth allocated will not guarantee anything if you have a seedless or even worse… a dead torrent. Checking and improving the health of your torrents is a very good way to ensure high speed. A torrent is a small file that contains all the metadata about files and folders. It does not hold any content data. It also contains a list of all the network torrent trackers that link you with the right peer (seeder or leecher). A seeder is a user who shares a file and a leecher is another user downloading the same file. It seems evident. A healthy torrent would be one with high activity, especially lots of seeders. Before downloading a torrent file, make sure that there are a lot of seeders. More seeders than leechers. 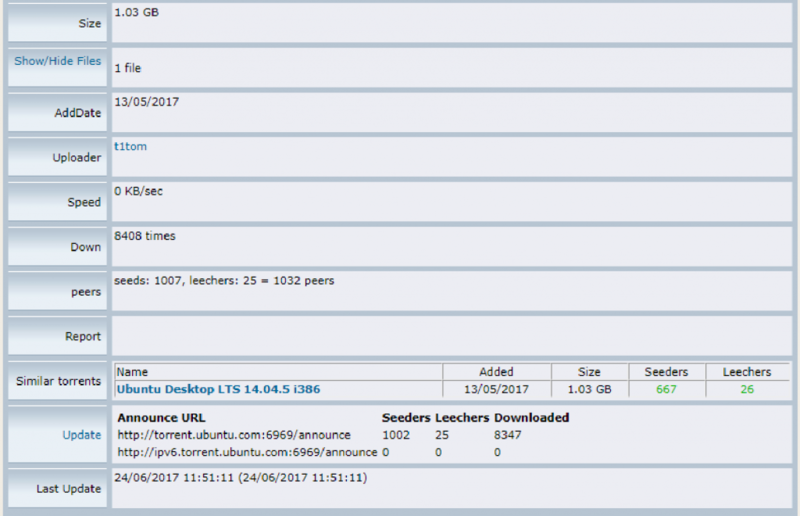 Free BSD sites like LinuxTracker.org, show a good amount of a torrent’s information before downloading it. You can know current peers (seeders and leechers), size, similar torrents and even trackers. To get a more accurate and actual health information, you can also check the file once is downloading. Go to the download bar, under Health and Seeds/Peers. You can see the current quantity of connected seeds and peers. Another way to increase the number of seeders is to update torrent trackers. These are the servers that help uTorrent client find extra peers. With more peers, a torrent download speed can be increased. Torrent trackers do this by publicly announcing the IP address of all peers sharing the file. To update a torrent’s tracker list, you have to find additional torrent trackers on the Internet. Right click on the active downloading torrent and go to properties. Copy the tracker list that you found and paste it to the end of the existing tracker list box in your uTorrent application. This will expand the connectivity of your torrent and improve the chances to find more peers. To display the trackers in use, press “F5” to show “detailed info”, go to your download and choose “Trackers” from the download bar. If you don’t want to depend too much on tracker lists, you can use different tracker-less methods to discover your peers automatically. Automatic discovery mechanisms find more peers in a swarm, without manually having to add trackers. Make sure the following mechanisms are enabled; as they will help when trackers are difficult to find. Peer Exchange “PEX”: It uses a single peer to share information needed to find and connect with other peers. Distributed Hash Table “DHT”: It is also known as “Bootstrapping”. DHT uses a decentralised system to find peers which reduce the load on central trackers. Local Peer Discovery: It supports the discovery of peers in local networks like LANs. To improve security, Local Peer Discovery avoids using ISP channels. To change BitTorrent protocol configuration, go to Options > Preferences > BitTorrent. By default, uTorrent enables DHT, Local Peer Discovery and Peer Exchange. If are downloading from public trackers, leave the boxes checked. BitTorrent is the only method used by uTorrent to distribute data over the Internet. If this protocol is limited, the connection with other peers becomes slow or impossible. Due to many reasons, agencies and ISPs all over the world discourage the use of BitTorrent. Some ISPs will attempt to throttle or even block any incoming BitTorrent traffic into their networks. If you find yourself unable to download/upload or your speed is too slow, your BitTorrent port might be blocked. To remain connected you must forward or map a port. Port forwarding or mapping is the act of making your local computer accessible to others through remote Internet access. In the case of uTorrent, it allows others (your peers) access your uTorrent through a defined port. Universal Plug and Play “UPnP” and NAT Port Mapping Protocol “NAT-PMP” are protocols that automate port forwarding. These protocols allow you to connect directly to the seeders and have a faster transfer rate. They need to be enabled on router/firewall and uTorrent application.To configure your connection settings in uTorrent, go to Options > Preferences > Connection. Under listening port, check the two boxes “Enable UPnP and NAT-PMP port mapping”. Also, don’t forget to allow uTorrent incoming traffic to your computer, check the “Add windows firewall exception” box. Enable UPnP and/or NAT-PMP in your router/firewall. New routers models have UPnP and NAT-PMP built-in but might be disabled by default. Check your router’s manual for instructions on how to enable them. Enable either one. If you are manually forwarding a port, you don’t need to enable UPnP port mapping. Some uTorrent versions and routers don’t support automatic port forwarding, so you need to forward the port manually. Choose a port. Go to Preferences > Connection >Listening Port. The standard BitTorrent TCP port range is from 6881-6889. But the protocol can be run in almost every port number, which is why it is difficult to block. If you don’t pick a random number, it is recommended to provide a port number over 10000. But be careful not to choose a port number that conflicts with another service. Allow your router/firewall uTorrent communication. Login to your router, under the “Port Forwarding” section and add the same port that you choose in uTorrent. uTorrent uses “Disk Cache” to maintain frequently accessed data in memory. This improves the response of the application because it doesn’t have to read and write every time into the computer’s hard drive. uTorrent controls these settings automatically and does a good job at this. The pre-defined values will usually work fine. It is recommended to change this only if you maintain a high torrenting activity. For example, you are downloading 20 torrents at the same time at 500Mbps. Otherwise, you might face a disk overloading or a “Disk Overload 100%” problem. To change cache settings go to Options > Preferences > Advanced > Disk Cache. A cache size too small might end up giving overloading problems and reducing speed. Check the box “Override automatic cache size and specify the size manually” and allocate a higher memory usage in MBs. Assign at least 512 MB for fast Internet speeds, like 100/1000Mbps. Uncheck the “Reduce memory use when not needed” box, so that the value stays the same. Free uTorrent versions have a bad reputation for displaying too much of sponsored advertisements. End-users experience is not pleasant, as they are forced to hear noisy ads or install third-party software. But forcing certain ads is the reason why uTorrent is still alive and free. A solution from uTorrent was to introduce a paid version that came without advertisements. Fortunately, you can also disable ads in free versions (especially new ones). To do this, go to Options> Preferences > Advanced. The big box displays a large set of flags that control the User Interface. The filter will help you find specific flags that enable ads. By default, ads are “True”, all you have to do is disable them by setting their value to “False”. For example, on the filter look for the word “sponsored”. The result will show you a flag with the name “offers.sponsored_torrent_offer_enabled”. Turn it off, by changing its value to “False”. Restart the application so that the changes take effect. Anonymity has one goal: hide your true identity when connected to the Internet. And there are many good reasons to hide. One reason is that P2P clients like uTorrent, make you vulnerable and susceptible. One of your seeders could be a black-hat hacker scanning IPs and looking for victims. Another reason is that your ISP might be monitoring and trying to throttle BitTorrent traffic. Don’t take a chance. Try it for yourself in less than 2 minutes. In uTorrent, press F5, to show “Detailed Info”, go to your download and then “Peers”. There, you can see all the information about the swarm that you are connected to. You can know about your peers, their public IP address and client version. For more information, check the Ultimate Crib Sheet for Staying Anonymous Online. There are some methods you can use to protect your identity and stay anonymous. Using these methods will also help to increase your download speed. 1. Virtual Private Network “VPN”. VPN uses a strong encryption to protect your traffic from being compromised. VPN is the safest method because it hides your true IP, thus your entire Internet connection. When you connect to a third-party VPN, you create a tunnel from your computer to the VPN server. The tunnel bypasses anything on the way such as hackers, ISP monitors, etc. A popular VPN supporting P2P connections is OpenVPN. Download OpenVPN GUI. Go into OpenVPN community downloads site and download their software. Install OpenVPN on your computer. If it is a Windows, the OpenVPN installation interface looks like this. Once the installation is finished, you need to configure the software so you can connect to a server. To connect to a server you need login details, the server’s IP, and a certificate generated on the VPN server. If you registered the paid service with OpenVPN. They will generate a certificate so you are able to connect to their servers. If you are using OpenVPN free client version, you need a certificate from another server and its credentials. To save configuration time. You can use a RapidSeedbox Virtual Private Server “VPS”, with a pre-installed OpenVPN, certificate and login details. A VPS works as an OpenVPN server that can be connected to a free OpenVPN client. To learn how to use OpenVPN with a VPS/Seedbox check this guide. How to test a VPN? Before connecting to a VPN, find your current public IP address. Go to WhatsmyIP, and write your address and location. Open the VPN and connect to a server. To make sure that you are connected and go to WhatsmyIP again. You will notice that the address and location are different. A proxy server doesn’t hide your entire Internet connection like a VPN. It will instead, encrypt only a specific program or port of your computer. Because a proxy is more specific, it is much faster and cheaper than a VPN, but unfortunately less secure. Start your uTorrent app, click Options > Preferences > Connections > Proxy Server Section. Enter your proxy server information and login details. Check all boxes and click Apply. 3.Seedbox or VPS (Virtual Private Server). If you want to take torrenting to a whole new level, a Seedbox or VPS is your best choice. A seedbox is not an encryption method like VPN or proxy instead, it is a dedicated server for torrenting. Seedboxes use these encryption methods and add another extra layer of security. To download/upload torrents, you connect to another “computer” through a VPN. 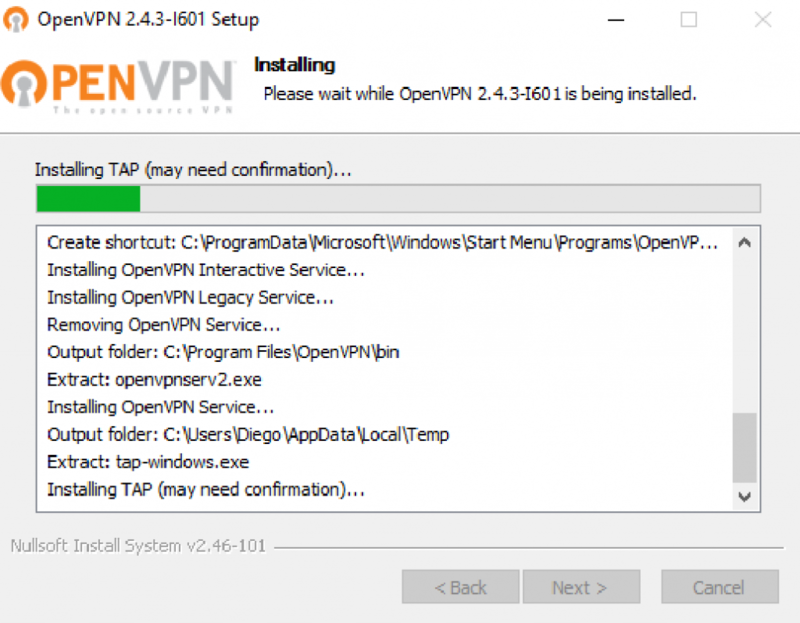 To save installation time RapidSeedbox comes with a pre-installed OpenVPN software. A Seedbox can also allow easy management of torrents through web application at fast speeds (often from 100Mbps to even 1 Gbps). With a seedbox, you don’t need to worry about being limited from your ISP or uploading/downloading too much. Your uTorrent can stay up 24/7 for 365 consecutive days. RapidSeedbox is the most popular Seedbox/VPS service online. It offers unlimited bandwidth, shell access, dedicated IP address, remote desktop, among many other cool features. To learn more about a Seedbox, check out the following video! To recognise torrent traffic patterns and shape them, ISPs use sophisticated application-layer firewalls. Encrypting uTorrent can help evade traffic shaping from those devices. But just enabling encryption protocol, will not help you become totally anonymous. But if your BitTorrent traffic is encrypted while using a VPN, there is little that a sophisticated device can do to identify and shape your traffic. Use a combination of VPN and BitTorrent traffic encryption. Encrypting BitTorrent protocol gives you privacy “the traffic is hidden”. Using a VPN gives you anonymity “your IP is hidden”. Go to Options > Preferences > BitTorrent. Under the “Protocol Encryption” and Outgoing box select “Enabled”. Check the box “Allow incoming legacy connections”. Virus and Malware Prevention . Safe torrenting is not 100% guaranteed. Protecting from malware has a lot to do with common sense and a bit of mistrust. The P2P world is full of scammers that will use fake torrents to attract targets and infect their systems. Whatever special antivirus you use, will not help if you keep downloading and connecting to untrusted sites. A famous quote from McAfee; “Social engineering has become about 75% of an average hacker’s toolkit, and for the most successful hackers, it reaches 90%”. Protecting from that hacker’s 90% ability to trick you has to do a lot about “not trusting everything”. The following are a few recommendations to stay safe in the P2P world. Watch from where you are downloading the torrent files. If you find what you are looking for, check the health of the torrent, the reputation of the contributor and other user’s comments. If the health of the torrent is low or it has no seeders at all, probably something kept other peers from sharing the file. Be especially suspicious of anything executable, such as EXE, ZIP, MSI or BAT files. If you are downloading software, be 100% sure of the file’s source. Music or movies usually have different formats; they don’t have executables. Formats like mp3, mp4, avi, mkv are not known to harm. Also, check the final file size; if it is less than 1Mb then probably it isn’t a movie. So how can you protect from the other 10%? Put your favourite antivirus to do its job… Scan files. 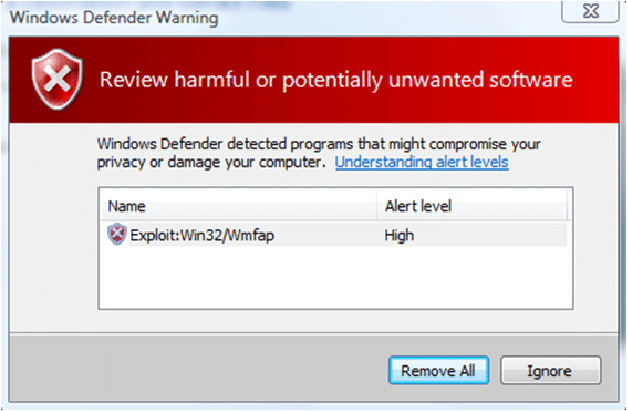 The following picture shows Windows Defender detecting a potential malware. Your antivirus might identify some viruses, others might go unnoticed and some will be false positives. Update everything, your antivirus software, OS, Service packs, even PDF readers. uTorrent premium offers automatic protection from viruses and malware. It will save configuration time, but it is just another powerful virus scanner. In the end, you can also get infected using premium versions. The strongest weapon against Malware is your own judgment. 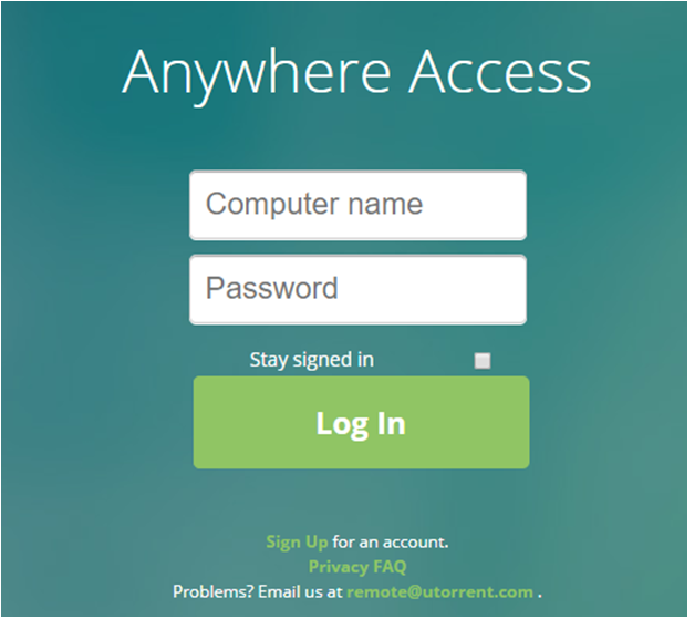 The uTorrent remote application allows you to manage uTorrent app anywhere. You can leave your desktop behind and use your mobile to manage your torrents remotely. The interface is very easy to use and similar to uTorrent. To configure it, you have to enable remote connections to your app. Open uTorrent app from your computer, Go to Options > Preferences > Remote. Check the box “Enable the uTorrent Remote Access”. Give your computer a name and password. Set a Security Question in case you transfer the remote account to another computer. To test it, go to remote.utorrent.com, write the computer name and password and “Log in”. Once logged in, you will be able to see your uTorrent app with current downloads/uploads right from the web browser. Before clicking “Update”, think about this… is updating your uTorrent version the best choice? Most uTorrent users are quite satisfied with old uTorrent v2.2.1. It is light, fast and doesn’t contain any embedded advertisements. But unfortunately uTorrent won’t offer old software versions in its library and there is a good reason why. Newer versions contain sponsored software, so that uTorrent keeps its software free and makes some revenue. But don’t undervalue newer versions, such as v3.5. It still contains advertisements but they are less annoying and easier to remove. New versions like 3.5 also have considerable faster transfers and valuable features like remote uTorrent. Whether you decide to stay with the familiar or modernise, take the following steps to either update or downgrade. Update: Go to Help > Check for Updates. uTorrent will automatically look for updates in its database and will inform you if there is an available package to download. If there is, go ahead and download right from the app (it is the safest). Download the older version from sites that offer old applications. Websites like Oldapps and Oldversion have good reputation and popularity. Backup the uTorrent AppData folder. Uninstall the new uTorrent version. Old software downloaded from “old app sites” could be identified as “Potential virus” from your antivirus software. If it was downloaded from a trusted site, ignore this.